Those of you who are hungry for food that is both healthy, and sustainably produced, read on, because this dispatch from the Summer Fancy Food Show in New York is filled with tasty treasures. Produced by the Speciality Food Association, the yearly expo is the largest of its kind in North America and represents a $120.5 billion industry that has grown 21.2 percent since 2013, according to a press release. Among the 2,670 exhibitors were food artisans and entrepreneurs, importers, exporters, distributors, food industry service vendors, and farm cooperatives. About half of the exhibitors came from over 55 countries, from Argentina to Vietnam. The rest were from across the United States, with Kansas, Massachusetts, Minnesota, North Carolina, Pennsylvania, Vermont, Virginia, and SUSTA (Southern United States Trade Association) showcasing their companies by state. The largest state participation was, not surprisingly, New York, with 267 food companies. Spreads, jams, dairy, salsas, bars, teas, baked goods, oils, snacks, confectionaries, bottled drinks, and prepared goods in thousands of combinations could be sampled by industry professionals only, as this event is not open to the general public. As journalist, I was looking for stories, and for companies that confirmed the trends that show Americans want their food locally and sustainably sourced, with minimal processing. Products like artisan ice cream, ethnic cuisine and spices, farm/estate branded items, healthy kids meals, artisan butchery, and ancient grains are other trends in demand, according to nearly 1,600 chefs surveyed in the fall of 2015 by the National Restaurant Association. It wasn’t hard to find evidence of these trends, and listening to the passion and the inspiring stories of the entrepreneurs, it wasn’t hard to believe that I was talking to the future of food in America. This company was started by two college students who learned from their professor that you could grow mushrooms in coffee grounds. They figured out how to do that and created a Mushroom Farm in a box. With that success they created Garden-in-a-Can, Garden-in-a-Jar, and Water Garden, where a fish tank below feeds plants that grow above. They also make clean label breakfast cereals packed in cartons that use less packaging than the usual cereal box. Back to the Roots has also developed a school curriculum that teaches students the science behind why plants grow. Through a donation program they’ve placed grow kits in 3,500 schools, according to Back to the Roots National Brand Ambassador Joey Terrill. Visit the company’s website to see pictures of children interacting with the plants. Off the Cob is an upstate New York-based company with a passion for sweet corn. Sweet corn is the kind of corn you eat fresh. It is different from the commodity corn that is grown mainly for animal feed and ethanol in America. Founder Cameron Sheldrake, a third generation farmer, started the company in 2012 at just 22 years old. The company is dedicated to supporting small corn farmers in the region. Off the Cob was featured on season six of Shark Tank, but failed to get an investment because their sales were not high enough, according to Sheldrake. That doesn’t mean the sharks didn’t like it, said Sheldrake. They all ate a bag of chips, and Mark Cuban ate two! One of the first booths I encountered was Due Cellucci (Dew-eh, Cheh-lou che), which means two little birds in slang Italian and refers to the two sons of self-described “Mamma Bird” Stefanie Bhalla, the company’s founder. Bhalla emphasized two things about her tomato sauces. First, they are really smooth, with just a bit of texture that makes them kid-friendly. Second, they are really versatile. This is no pasta sauce, she said. Although they are great for pasta, they can also be used in a variety of other recipes. On her website, Bhalla lists options like Oven “Fried” Broccoli served with traditional sauce, Baked Eggs with Burrata, Artichokes and Spinach, Zucchini Lasagna Roll Ups, and so on. The New York-based company’s marketing literature emphasizes that the tomato sauces, which include tomato basil sauce, vodka sauce, and traditional, are all-natural, made in small batches (artisan), and that every jar tastes homemade. Bentonville, Arkansas-based My Brother’s Salsa is another family-oriented company that began with founder Ashley Pointer’s love for her brother’s salsa recipe. Lampkin said her family has always been big on salsa—thus the varieties, which include small batch-made Hatch Green Chile, Cranberry Orange, and Cucumber Tomato. Lampkin emphasized how much effort the company puts into ensuring their Black Bean and Corn salsa gets into the jar so that each piece of vegetables remains intact and can be enjoyed. She said bigger companies puree theirs to fit it into a machine. My Brother’s Salsa does it by hand. Stahlbush Island Farms, which may be best known for its first retail product, a canned pumpkin puree, is actual a model of sustainable farming in Oregon’s Willamette Valley. The company won the Sustainable Food Plant of the Year by Food Engineering Magazine, for its first in North America biogas facility that turns the farm’s food waste into energy, hot air, and steam. The family farms 5,000 acres and processes a wide variety of fruits, vegetables, grains, and legumes into frozen and canned products. The company’s Fancy Food Show display said it all, with rows of brightly colored foods lined up like a scrumptious rainbow. I asked someone at the booth what was new, and she said it’s colorful vegetables that appeal to kids. “Are they marketed for kids?” I asked. No, the family just liked the idea, and colored vegetables appeal to kids. So you can buy frozen bags of Tri-Colored Sliced Carrots in hues of orange, yellow, and purple, and a bag of Cool Cauliflower that is purple, orange, and green, or Chopped Curly Kale, and Green Garbanzo Beans. This is in addition to unique regular offerings, such as Marion Blackberries, Cut Rhubarb, Black Raspberries, and Red Grapes. The company emphasizes its ability to pick at the peak of freshness, due to its onsite processing. To maintain soil, the family uses cover crops, crop rotation, water conservation, soil testing, and minimal inputs. Many of their products are not organic, but this farm is committed to minimal use of chemicals. The entirety of how they manage their farm ensures this commitment. 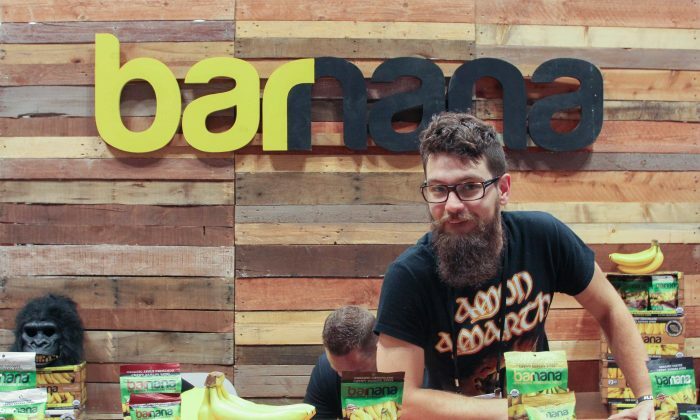 California-based Barnana is another sustainably-minded company that rescues unwanted bananas from organic farms. The bananas are good to eat, but they may be a little overripe, have scuffs, or an imperfect size. Co-founder Caue Suplicy grew up eating dehydrated bananas made by his father Joao Suplicy, who invented the process in Southern Brazil, where they lived. Later, as a triathlete in California, the potassium-rich dried banana was Caue’s go-to snack. He shared it with friends and other athletes, and they loved it too. The product comes in bite-sized chunks. There is original, apple cinnamon, peanut butter, dark chocolate, coffee, and coconut. And they are really good, nothing like the sugar-coated hard banana slices we grew up with. EATPOPS is the invention of former law-student Sophie Milrom, who was looking for a guilt-free snack that would satisfy her sweet tooth during late night study sessions. It is basically fresh juice on a stick, but Milrom made sure that her unique flavor combinations taste good. I tried Activate, the bar made with beet, carrot, and apple, and Super Detox, made with acai, goji, noni, and cherries. Milrom says her juice bars help to extend the shelf life of fresh juice, and with 3-ounce servings, the calorie counts are low (45–100 calories), and just two of the seven flavors have a bit of added agave sweetener, so they have a low glycemic index. For those who thought kale was out, think again, because Rhythm Superfoods is taking the green leaf to another level. They advertise their products as a nutrient-dense alternative to standard fried chips. They are handcrafted in small batches and air-crisped on low heat rather then fried. An exciting range of flavors include Mango Habanero, Bombay Curry, Texas BBQ, and Kool Ranch. They also make beet chips and broccoli bites. The kale products are organic, and all products are non-GMO certified. Milkadamia makes milk out of macadamia nuts, from nuts grown on family farms in Australia. It is the perfect region for growing the nut, and this explains why it’s grown there and shipped here. Some commodities are just like that. This is a simple company, with just two products: original and unsweetened. A map of the United States on the company’s website show its available only in scattered locations. The milk “grown with love” was at the show looking to expand its distribution. Introducing the good for you french fry! Veggie Fries are a frozen french fry made with a blend of potatoes, other vegetables and legumes. Each variety has at least 27 percent vegetables other than potato. As a product that appeals to kids and busy families, it is not surprising that veggie fries are available in major grocery stores like Wegmans, Stop&Shop, ShopRite, Giant, Fairway, Whole Foods, and many others. You can choose from four varieties: carrots and potatoes, broccoli and potatoes, chickpeas, red peppers and potatoes, or kale, tuscan beans, and potatoes. This family-owned company wants kids across America to eat better. Now lets move on to Brooklyn-based Pure Genius, founded by Nancy Kalish. A certified health coach with a sweet tooth, Kalish named her company after the genius it takes to put beans in brownies. Pure Genius uses chickpeas to add protein and fiber to a popular American treat that hasn’t traditionally had much to offer for nutrition. Right now they make a Deep Chocolate Brownie and a Chocolate Chunk Blondie, but Sales Genius Brittany Barton told me they have lots more in the development pipeline. Still on the subject of beans, Italy-based Pedon Group has come out with a single-ingredient pulse pasta produced with clean energy. The green pea pasta, red lentil pasta, and chickpea pasta boosts about double the protein, double the fiber, and 30 percent less carbohydrates than regular pasta. They are also making a pulse pasta mac & cheese for children with no artificial colors or preservatives that is ready in 5-6 minutes. A range of unique sauces, including Coconut Curry, Health fredo, Goji Carbonara, Hempy Pesto, and Chili Non Carne, take advantage of nutrient-dense superfoods, and new flavors that naturally complement pulses. Now let’s talk about the sweet stuff. Even in this category, innovation in sourcing, and with ingredient combinations, is exploding. Vermont-based Big Picture Farm took home this year’s sofi Award (presented by the Specialty Food Association) for its Sea Salt & Vanilla Farmstead Goat Milk Caramels. According to co-founder Lucas Farrell, the unique taste of its caramels come from browning the milk fat at just the right temperature. Goat milk also has a different range of animo acids than cow’s milk, which gives the product a sophisticated flavor. After five years of operating his artisan confectionary company, Farrell says they have come to understand how to adjust the recipe as the chemistry of the milk changes over the seasons. Go to the company’s website to see line drawings of Big Picture Farm’s 36 goats, each one named. Meet Gertrude. Meet Cicada. Meet Winnie. The farm’s website says the health and happiness of their animals is the center around which the farm and farm products revolve. And finally, meet Milkboy Swiss Chocolates. The company was started by Emanuel Schmerling in 2015. Schmerling was born into a chocolate making family in Zurich, Switzerland. He started Milkboy in Brooklyn last year to return the splendor of Swiss chocolates to United States consumers. Milkboy is committed to manufacturing in Switzerland. Historically, the quality of Swiss chocolate comes from the quality of Swiss high alpine milk, and a traditional process of smoothing out the chocolate that takes 24–48 hours. According to Schmerling, the larger companies Lindt and Nestle no longer manufacture using Swiss ingredients. The brand features a unique papercut design that evokes the tradition of celebrating the milk boys leaving with the cows for summer mountain pastures. Flavors evoke that alpine quality as well. There is a dark chocolate with essential pine tree oil, milk chocolate with lemon and ginger, and a white chocolate with bourbon vanilla. CORRECTION: A previous version of this article had the wrong attribution for the founder of My Brother’s Salsa. The founder of My Brother’s Salsa is Helen Lampkin. Lampkin’s daughter, Ashley Pointer, is the general manager. Epoch Times regrets the error.